August was a rough month for U.S. job seekers Regional and state unemployment rates remained largely unchanged throughout the nation – yet minor employment fluctuations were still seen. Twenty-six states saw unemployment rate increases, 12 states saw employment rate decreases, and 12 states experienced no change at all. While the over-the-month rate changes were certainly disappointing, the U.S. Bureau of Labor Statistics recently released over-the-year data for August 2010 to August 2011. The gains in employment are visibly much more encouraging. “Over the year, 25 states experienced statistically significant changes in nonfarm payroll employment, 24 of which were increases,” the B.L.S. confirmed. Texas experienced the largest employment increase with 253,200 jobs added, followed by California with 171,300. 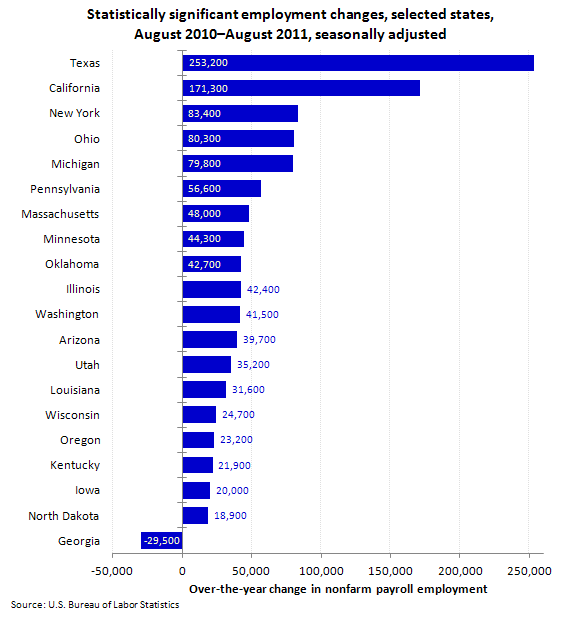 New york and Ohio came in third and fourth place with 83,400 and 80,300 jobs added respectively. Michigan followed up in fifth state with the highest employment gains at 79,800. The only state to see a statistically significant decrease in unemployment was Georgia, with 29,500 jobs lost. While Texas lays claim to most jobs added over-the-year, the largest over-the-year percentage increase in nonfarm payroll employment belongs to North Dakota, with a 5.0 percent gain. Utah and Wyoming tied for the second largest percent increase over the year with 3.0 percent each. While the over-the-year employment gains are a step in the right direction, the job market needs to be making leaps and bounds in order to return to pre-recession employment levels. Jobs just aren’t returning fast enough and U.S. government needs to rethink their ineffective job creation strategies in order to get the nation back on track in the near future.